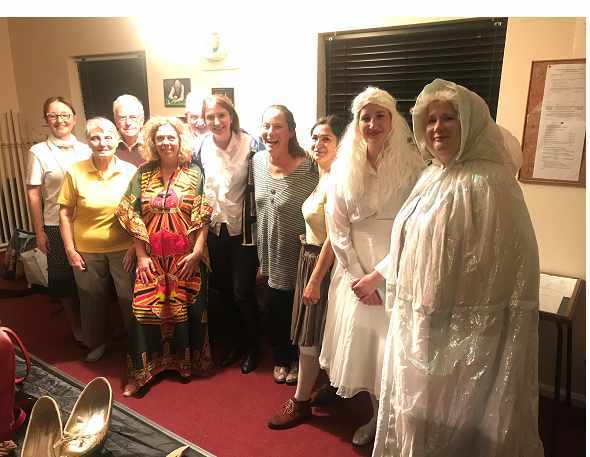 Buckland Monachorum Drama Group’s next production is a comedy called “White Spirit” by Lucy Turmaine. Performance dates are the 4th, 5th & 6th October 2018, @ 7.30pm each evening. There is no matinee performance. Tickets are available now at £6 each. You can book tickets by emailing: tickets@bucklandmonachorum.org.uk or by calling 01822 855336. The story starts with Prince Charming arriving to awaken Snow White, his one and only true love. Only he’s a bit late and she is actually…..dead! Undeterred, he sets out to find a cure, hampered by the ghost of Snow White, who thwarts his attempts to marry another when a cure proves impossible to find. Although created for adults, anyone over the age of eleven should get the jokes! The cast with Author of the comedy, Lucy Turmaine (4th from right) after the Friday night performance.